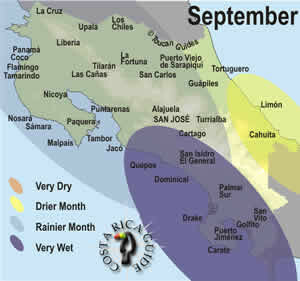 Costa Rica September rainfall patterns. September is one of the rainiest months on the west coast and one of the driest on the east. You have to be a little choosy to find the best things to do in September and unless you know where to look the wildlife might be hidden away trying to escape the rain. September is one of the rainiest months of the year on the west side and in the mountains of Costa Rica and one of the driest months on the east side. In September the Pacific beaches and central region normally get significant rain most days; generally with a pattern of sunny mornings followed by showers in the afternoon or evening. Occasionally tropical lows stall off west coast or the edge of a hurricane skims across from the Caribbean bringing several days of continuous heavy rains. Even in rainy months like September the Costa Rica Time Machine can match your vacation time with the best destinations. The southern Pacific and Osa peninsula are inundated by days or even weeks of continuous rainfall driven by westerly winds and referred to as temporales del Pacífico. Rain is measured in feet rather than inches. Many of the lodges and tour operators are closed until November. Humidity is generally not as bad as people expect it to be in the tropics but if it is going to get sticky this is the time of year to expect it. Climate change is most noticeable as extreme weather gets even more extreme and Costa Rica is no exception. The 2017 rainy season was one of the wettest on record and even stretched into 2018. September started out quietly but when tropical storm Nate moved in at the beginning of October it devastated the Pacific side of the country with record rains, flooding and destruction of property. We were fortunate to be on the Caribbean side where it was relatively sunny and warm. The rainy season which normally ends by New Years was not only much wetter than normal but also longer. We experienced a rainy season worthy downpour in Manuel Antonio in mid February. Even people who grew up there commented that they had rarely seen anything like it. The Caribbean side of the country gets a reprieve in September and October as the Talamanca mountains force the moisture out of the westerly winds bringing clear weather especially in the southern Atlantic beach areas of Cahuita, Puerto Viejo and Manzanillo. Along the coast daytime highs are 80 to 88 °F (27-31 °C) with lows overnight about twelve degrees lower 68 to 76 °F (20-24 °C). Daytime temperatures around the central valley are usually 75 to 85 °F (24-29 °C) this time of year and it cools off more at night. Higher in the mountains (around Poás, Monteverde and the San Gerardos) it can feel chilly (52-66 °F and 11-19 °C) whenever you’re out of the sun. In general “green season” (rainy season between June and December) travel is gaining popularity in Costa Rica, but it’s unlikely any except the most popular hotels will be booked in September. You’re safe to travel without a fixed itinerary or reservations but watch road conditions to make sure you can get where you’re going (and don’t try Drake, Corcovado, Golfito, and/or Zancudo). If you do decide to travel to the southwest and Osa peninsula check to make sure that the hotels and lodges you’re interested in are actually open and accessible. The drier weather in the southern Caribbean this time of year makes it a relatively undiscovered rainy season bargain but word is getting out and if you have your heart set on a particular hotel you should probably have reservations. Lower numbers of travelers mean lower prices and most places on the Pacific side offer discounts of 20-40% throughout September. On the Caribbean September is the high season so discounts are generally not available. September 2019 is looking likely to be a La Nada ENSO (El Niño Southern Oscillation – Neutral) month which means it’s particularly unpredictable weather.